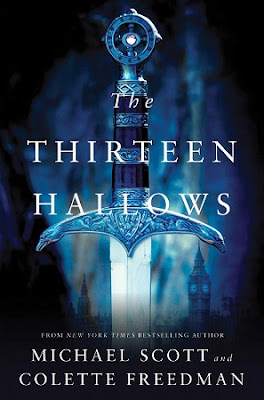 Whatever you’re expecting when you first pick up The Thirteen Hallows (Tor), lay it aside. This will never be the book you guessed it would be. And while that’s not necessarily a bad thing, it’s best to go in with you r eyes open. For one thing, the book is surprisingly violent. Again, that in itself might not be a dealbreaker, but it’s a good thing to know before you start to read. If you are the type of reader who is put off by careful and graphic descriptions of violence, this might be a journey you’d best not begin. But will it be a worthwhile journey, in the end? Well, this whole reading thing is pretty subjective, isn’t it? Some readers will be so put off by those details, they won’t ever forgive these authors. And, in a way, that’s not surprising. They write so well that even readers normally comfortable with a certain amount of graphic this and that might at times feel close to losing their lunch. Just in case you’re getting the wrong idea, there’s more to The Thirteen Hallows than violence. A lot more. The title’s thirteen hallows refer to a series of carefully guarded artifacts. Alone, each one is powerful but their combined power could be unthinkable. Because of this, they have been watched over by their Keepers since the Second World War. But now the Keepers are being murdered; the hallows compromised. One of the Keepers convinces a stranger to deliver her Hallow -- a broken sword -- to her nephew, inadvertently involving two innocents into a mystery centuries old. Prolific novelist Michael Scott (who also writes as Anna Dillon) co-authored The Thirteen Hallows with international playwright Colette Freedman and the result is electrifying. Great review. So spot on! Loved this book... fast paced and thrilling.